Experience heightened stress and frustration whilst driving. It is therefore no surprised that these drivers are four times more likely to crash and cause injuring/death to themselves and others. So what is the safest way for a mobile device to be used whilst driving? It is not simply illegal to use a mobile phone whilst driving a vehicle as the law also extends to instances where your vehicle is stationary at driving lights or stuck in non-moving traffic. The penalty for this offence is fixed at 3 penalty points together with a fine of £100. In some instances the matter may proceed to a court hearing where the penalty can be increased to a fine of up to £1000 in addition to the points. Professional drivers such as those operating a bus of heavy good vehicle risk a fine of up to £2500. The court also has the power to impose a discretionary disqualification instead of points. It should be noted that even if you are using a hands free phone whilst driving you must remain in control of your vehicle at all times as failing to do so might result in prosecution. The penalty for this slightly different offence is the same as that for driving whilst using a telephone. As such, if an officer sees you operating a hands-free device but still feels that your attention is diverted or control of the vehicle restricted you can be stopped. 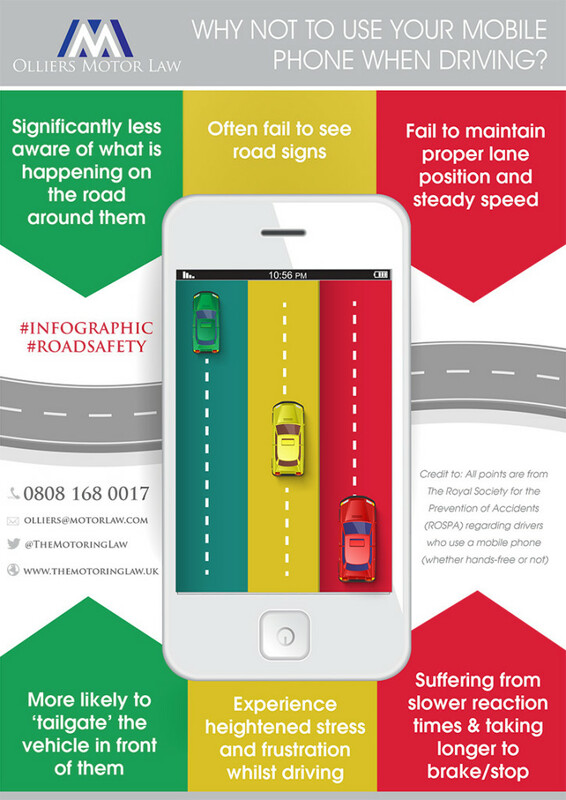 The safest way to use our phones whilst driving is simple: refrain from using them! However, for those who are required to drive all (as part of their employment for example) it is not always practical to abstain completely from making calls whilst driving. So how can we use our hands free devices correctly and within the confines of the law? Plan your trips and try to make calls when parked. If you pull over to take a call, make sure your vehicle is parked in a safe location: Remember never to pull up on the hard shoulder of a motorway and do not stop where you could be a hazard to other drivers or pedestrians. Tell callers you are driving if you choose to answer a call: This reminds a caller to keep the call brief, inform them that driving is your priority and you may not be able to concentrate on the subject matter of their call. Don’t take your eyes off the road: Never send text messages whilst driving nor use the features of a smart phone to ‘Google’ anything or look up phone numbers. Do not make calls in poor weather conditions: Adverse weather conditions demand more of our attention than usual so any additional distractions should be avoided. Don’t talk about complicated/upsetting issues. If the call you are making becomes emotional or argumentative end the call immediately. Emotional conversations are distracting and a hazard whilst driving. Make the most of your phones features: Modern smart phones have a significant number of features which assist in making hands free calls. Learn how to use the speed dial features or the voice activated dialling system. Furthermore, most blue tooth systems have automatic answering features. Use your phone in an emergency to call 999 or 112: Dial 999 from your mobile phone and you will be connected to the emergency services. You can usually call 999 from a mobile phone even if your phone is not able to make other calls. The call is free and you will be connected even if you do not have adequate signal.